This edition of stories from Japan is going to be a bit of this and that. First, I will tell you about the couple of bike rides that I have managed to do in the last three weeks. On 26 Apr I wondered around through town until I got on the banks of the Natsui River. This I followed until I reached the Pacific, about 10 Km from my apartment, then turned to the south on a regular highway that follows the coast. The river ride was worth doing once but it is not the way to ride down to the ocean. Much of the riverbank road was gravel or broken up pavement and is not the best of surfaces. There is also a problem with crossing the many highways that cross the river. Usually you have to leave the river and cross the highway then rejoin the riverbank road; it makes for a rather slow ride. The coastal road was a secondary road that carries a quit a bit of truck traffic but has a 50 Km speed limit that is respected and the traffic is VERY courteous. So I rode into a small fishing village, and a dead end, about 7 Km south of the river mouth. 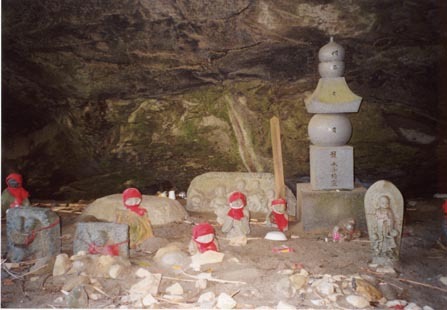 There I found a cave that has been turned into a Buddhist temple of some sort. 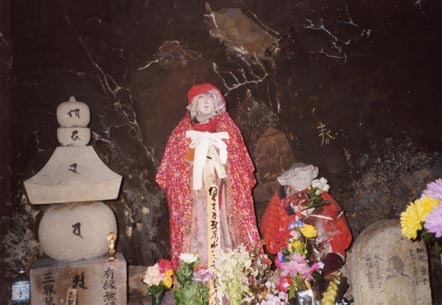 It is very hard to describe everything that is in the cave and I didn't have my camera with me (I am planning on going back to get some pictures). 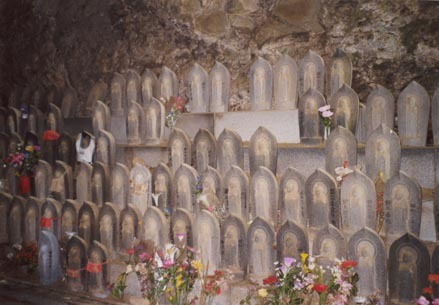 However, it has a lot of small Buddha statues that seem to have been placed there as remembrances to dead children. In addition, there are crutches or prostheses that have been left as a sign(?) that the owner was cured. When I headed for home I took a more direct main route back into town and rode one of the main streets through town to my apartment. The traffic was fairly heavy but again VERY courteous and I had no problems - not a horn honk all day. It was great! Not a lot of distance, only 32 Km, but a very nice day and good ride. The Riverbank of Sai. The captions for these three photos are from Kangaroo Notebook; by Kobo Abe, translated by Maryellen Toman Mori. In the novel Abe says that there are 164 Riverbank of Sai sites in Japan, I don't know if this is true but this one that I found seems to fit the description. Nestled beneath mountains in the nethereworld. Just to hear it wrings the heart. Gather on the Riverbank of Sai. "How I miss you, Father! How I miss you, Mother!" Whose sadness pierces flesh and bone. My brotheres and sisters in my hometown." Suddenly a demon from hell appears. "What are you kids doing?" he growls. Don't perform rites for your repose. Of cruelty, grief, and misery. Your parents' laments are your punishment. And topples the children's little towers. That burn all creatures to the bone. I got out again on the 1st of May. This time I rode back to the coast on the main road that I had used to return on my previous ride. However, I turned to the north this time with the intent of riding about 5 Km and then turning west just south of the first train stop (Kusano) north of Taira. There I was going to join another road that parallels the coastal road and runs north about 70 Km. I had a bit of navigational problems and didn't hit the road that I wanted where I thought it would be but found another one that I thought would continue west and let me loop home. 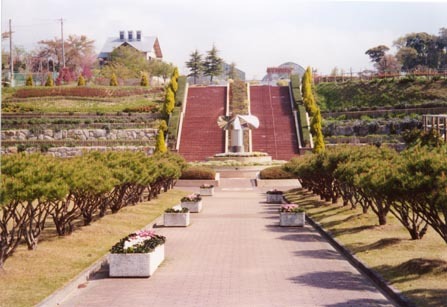 I climbed up through a small canyon and park area with hiking trails and into a mountain range that reaches about 225 meters to the Iwaki Flower Center (this is a very large flower garden including a large greenhouse). From there I was able to get a great picture of Taira and then plunged down an equally steep road returning me to town and home. It was only a 37 Km ride but had all the aspects of a good ride: not much traffic (5 cars during the 5 Km in the mountains), good weather, great views. In the first row above starting from the left, this is near the beginning of the climb up to the top of Mt. Ishimori and the Flower Center. 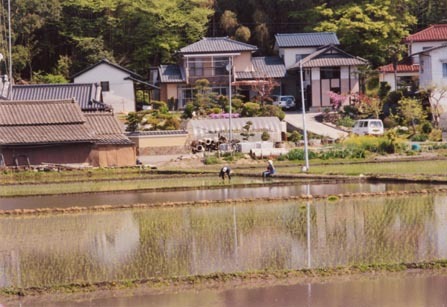 It is rice planting time in all the paddies on the edge of Taira and between the towns of Iwaki City. 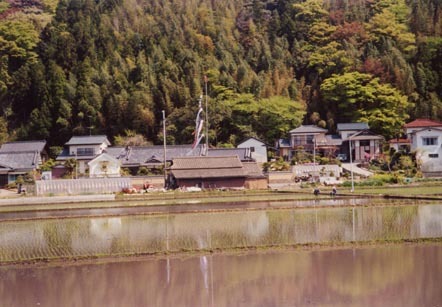 What look like flags flying from the pole above the house in the picture are actually carp banners. Cloth or plastic banners shaped like carp are flown for about a week to celebrate Boys Day. Iwaki City Flower Center is at the top of Mt. Ishimori. The total grounds cover 250,000 sq. meters with a hot house containing rare and tropical plants. It is only 6 Km from my apartment but the last Km is very steep. 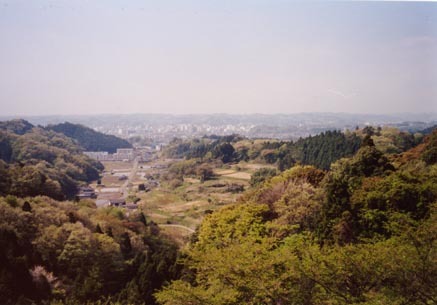 Then in the second row on the left is a view of Taira with Ryugajo Hill just visable to the right over the small hill in the foreground. The picture above and these two give you an idea of the geography and a bit of the vegetation. 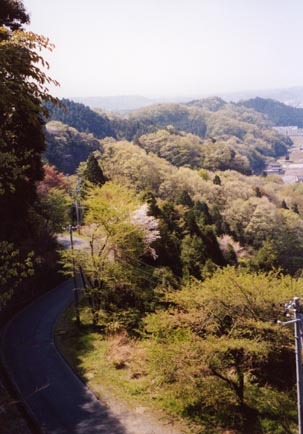 In the center is Taira in the distance with one of the roads back to town exiting the trees in the foreground. I didn't take this one because it looked too steep but found that my selection was just as bad. The far right picture shows alternate route that I took back home. The bad news is that has been the extent of my rides. All the other days that I have had available have been either raining or I have had homework, dental appointments or other busy work requirements. One of those requirements is to find, and buy, a computer so I can remain in contact with the Net and have an e-mail connection. This site at NTT (the national telephone company) in Taira is pulling their free computers and e-mail services effective 1 June. They put up the notice last week and I was out shopping here in town on 15 May. It looks like my best bet is going to be to get something through mail order out of Tokyo. I can buy something in Taira for about the same price but it will have the Japanese version of Windows; I can use that and in fact have been. But if I am going to buy something I have reached the decision that I will buy a lap top with English Windows and then I will have something to take back with me and use in the US or wherever I end up. The other news concerns spring. It has finally arrived, or it has if you believe the Japanese. 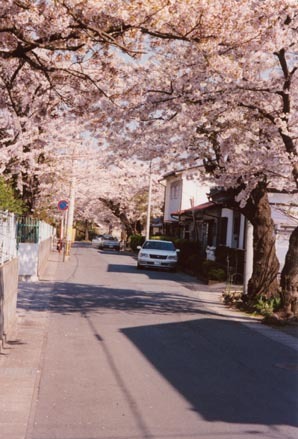 They consider the start of spring to coincide with Cherry Blossom Season; this is the week or 10 days when the cherry blossoms are providing their blaze of color. They are not the first flowers of spring but have a long tradition of signaling its start. There are parties under the trees in the most popular parks for long rounds of eating and drinking. April is also the month of new beginnings; it is the start of most fiscal years, new employees are hired, university and school years start, etc. It has been after the cherry blossoms were gone that the area has really starts to bloom; there is a raging flower garden all over Taira at the moment. Many flowers I don't know but I do recognize tulips, poppies, Japanese magnolia and camilla. The weather is still unsettled to say the least and we are getting rain about every other day now with the promise of Rainy Season to come in June. I think rainy season is ruled by the calendar rather than if it is raining or not but my students insist that it isn't "rainy season" yet. I will be letting you know what the difference is in a later letter. All I know is that I was soaking wet by the time I finished my walk home last Sunday night. It continues to cool down very nicely during the night at the moment but the days are warming up, all of this to change in June through August. The promised weather is VERY hot and humid! A rare beautiful day during Cherry Blossum Season. Most of the time it was cold, raining, or the wind was blowing - sometimes all three at the same time. The park in the picture on the left is on the eastern side of The Hill that I walk around or over every day. The picture on the right shows the southeastern part of The Hill from the crosswalk at the Taira JR Station (railroad). 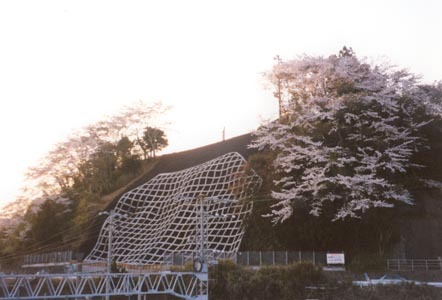 It not only shows cherry blossoms but also what they do to the sides of hill and mountains in Japan. They make cuts so steep that they destabilize the hill and then must reinforce it with some kind of bulwark, this one is less ugly than most because they filled the squares with soil and grass. 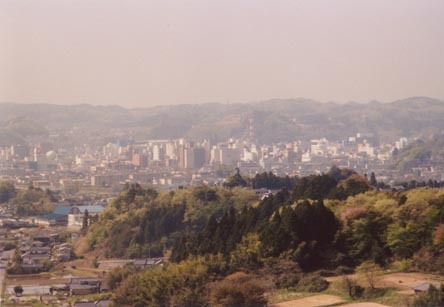 To the left in that picture was where I stood to take the panorama pictures of downtown Taira. 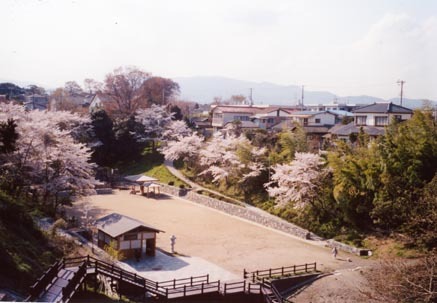 The center of the picture shows the entrance to a shrine that is just out of view behind the cherry trees to the right. The picture on the left is of the street that is another part of my route over the hill; a girls high school is on the left in the photo and I see some of my students as I pass by. That is it for the time being. I may be a little late in getting the next installment of this saga in the mail but I look forward to your mailed replies. The bike shop owner that I have met has a Net connection that I will use to check for incoming mail until I get my computer set up. Hopefully I won't be off line very long.